Ireland is home to some of the most stunning scenery in the world. While some countries draw crowds for its nightlife or food scene, one of the biggest draws for locals and visitors to Ireland is its nature. Postcard scenery thrives in abundance across the Emerald Isle and whether you’re craving a dramatic landscape as far as the eye can see, wild, weathered cliff faces or dynamic rock formations, Ireland has it all. Here are the top 10 natural wonders of Ireland which are worth adding to your bucket list! Burren National Park, or just The Burren, is a stretching terrain that sits in County Clare. The Burren has a lunar type landscape with seemingly barren stretches shooting far off into the horizon at every turn. It is a karst landscape, meaning that it’s formed from the dissolution of glacial-era limestone rock. This intricate but vast terrain is filled with caves, curious rock formations and archaeological sites of interest. Situated in the renowned Ring of Kerry is Torc Waterfall. Stretching over 65 feet into the sky, this cascading waterfall lies at the base of Torc Mountain, which is situated in Killarney National Park (another natural wonder in itself). Only five minutes walk off the beaten track, this super accessible natural wonder is a perfect addition to the itinerary of those less able, as well as anyone who craves a bit of natural beauty! Adventurers: this is the Irish natural wonder for you! This narrow mountain pass sits snug between majestic Irish mountains the MacGillycuddy’s Reeks and the Purple Mountain Group. Located in County Kerry, a trip through the Gap of Dunloe is a worthy addition to any adventurer’s itinerary when exploring Ireland. At an impressive 398 feet tall, Powerscourt Waterfall is Ireland’s tallest waterfall. Set in the stunning surroundings of Powerscourt Estate in County Wicklow, a trip to this natural wonder is super accessible from Dublin as a day trip. Although the waterfall is located only 6 kilometres from the main estate, do not walk as there is no direct footpath; a car or taxi is advised when making the trip. The stunning Slieve League cliffs sit on the Coast of Donegal stretching into the wild Atlantic Ocean. Weathered by centuries of sea winds and water, these majestic cliffs are indeed one of Ireland’s wonders. Standing at nearly 2,000 feet above sea level, these are some of the tallest cliffs in Ireland and definitely worth a visit! This impressive sea stack sits off the coast of County Mayo in Ireland. As curious as it is impressive, Dun Bristé is undeniably one of Ireland’s natural wonders. Dun Bristé, meaning The Broken Fort, stands at nearly 150 feet tall and is a flat-topped sea stack. As the story goes, there are 365 islands to Clew Bay – one for each day of the year! Arguably one of the prettiest natural wonders in all of Ireland, this endearing bay is made up of a network of islands in County Mayo. While most of these little islands are uninhabited, they sure make for a sight for sore eyes! Set off the coast of Kerry is an impressive cliffs formation, locally known as “Cathedral Rocks”. 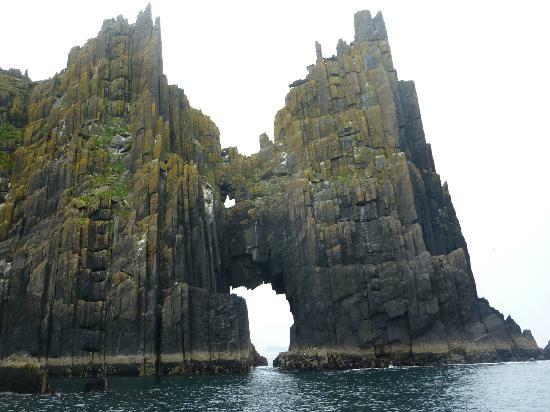 These curious, looming cliff faces are something from a fantasy novel and pose for quite the picture, too. It is said they resemble the bones of a magnificent church, hence where the name comes from. The Cliffs of Moher are arguably one of Ireland’s most popular tourist destinations. Running about 14 kilometres along the west coast of Ireland in County Clare, these magnificent cliff faces are undoubtedly impressive. A top tip would be to visit at sunrise or sunset to truly experience this Irish natural wonder! One of the most impressive natural wonders of Ireland is The Giant’s Causeway. Set in County Antrim in Northern Ireland, the Giant’s Causeway consists of about 40,000 defined basalt rock columns which jut out from the landscape. The cause of this curious terrain is an ancient volcanic eruption. The Giant’s Causeway is listed as a protected UNESCO world heritage site.